With the Tribe at or near the top of the AL Central often these days, cheap Indians tickets can be harder to come by. But you still have some ways to save a few bucks on tickets – here are three courtesy of Ballpark E-Guides. The fire pit is a chick magnet. Especially in April. Cheap Indians Tickets, Tip #1) Brave The April Cold. Cleveland weather being what it is, the Tribe doesn’t generally draw big crowds for April games, especially on weeknights with dynamic pricing. This is a great time of year to save on Club tickets or tickets with access to the Home Plate Club, and you can duck out of the cold in the club. 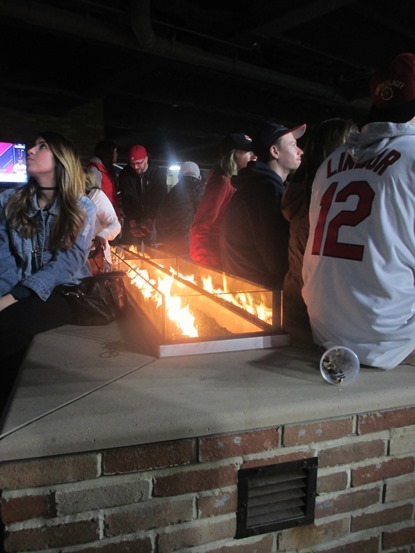 You can also order a cheap ticket and move to the upstairs section of the Corner bar, and move to the fire pit between innings. And who knows, it might not be that cold that night. 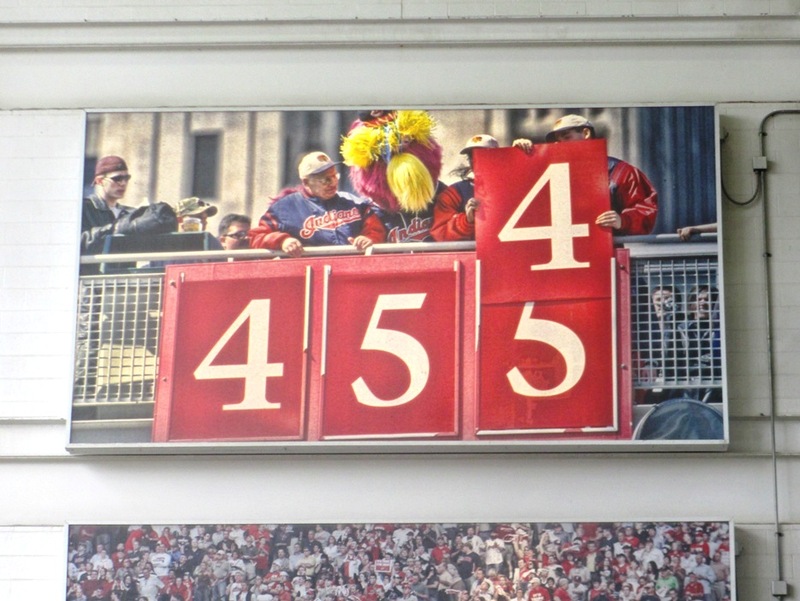 I’ve gone to April games in Cleveland that weren’t too bad. Nothing like a broken-in baseball glove. Cheap Indians Tickets, Tip #2) Take The Volunteer Challenge. 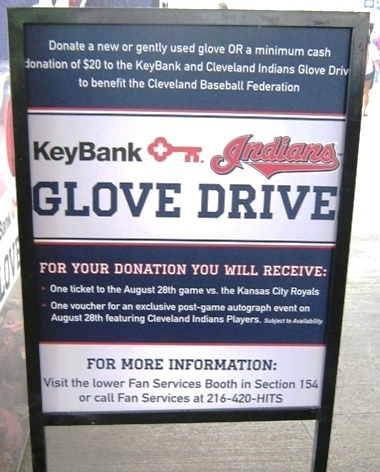 The Indians sometimes offer tickets and other rewards to philanthropic sorts; you can sometimes score tickets by donating cans of food or a used glove. If you give your time through the team’s Volunteer Challenge, you can reap some rewards when you build up a number of volunteer hours, including game tickets. Who says good deeds aren’t appreciated? Not the Indians! You can find opportunities like this in the Community section of the Indians’ website. Just in case there is no one at the window. 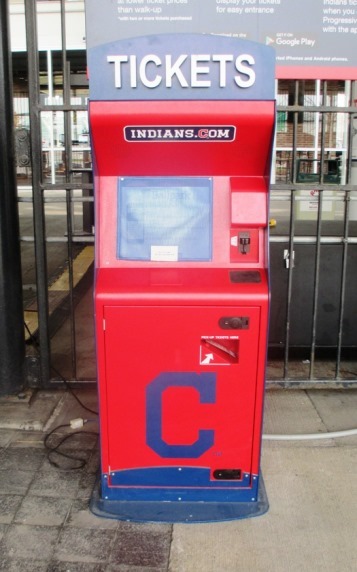 Cheap Indians Tickets, Tip #3) Eschew The Fees. If you know a game probably won’t sell out (see the April tip above), try getting your tickets at the box office or the team shop rather than online…with multiple tickets especially, you can save a considerable chunk of online fee change. The only exception is the District Ticket, which is only available online. Bonus tip: the Indians sometimes waive ticket fees and will tell you so in their e-mail ticket alerts; that’s the time to snag those District Tickets. Click the image to find deals on Indians tickets. Cheap Indians Tickets, Tip #4) Bonus Tip: Try SeatGeek. SeatGeek is my favorite third party outlet for Indians tickets, and I’m not just saying that because they’re an affiliate. SeatGeek searches from a number of ticket outlets, and I frequently find better deals there than on StubHub. There you go; three ways (+1!) for you to land some possibly cheaper tickets to see the 2016 AL Champion Cleveland Indians. Stay tuned, I’ll post more.